Monocle Magazine’s Most Liveable City, Again. I came across this short film about Munich while looking for a link for the Guide that I’m working on for Design Sponge. 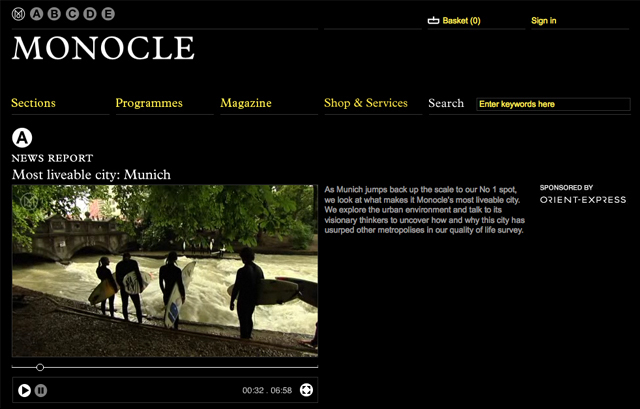 I knew that in 2007 Monocle Magazine had named Munich it’s most liveable city, but I didn’t know we won again in 2010. I just spent the weekend in Berlin for the totally incredible Hello Etsy! conference. Yes Berlin is an entire order of magnitude cooler than Munich, yes there is tons more sub-culture up there and yes Berlin is just where it’s at. But! Once again, I was really happy to come back to Munich, which feels like a lush garden of Eden in comparison to the in your face grittiness of Berlin. Watching this film gave me a little boost and reminded me why I’m so happy to live here. Anyway, it’s a Euro-cool, snazzy, jazzy little 7 minute film that’s fun to watch. Next articleUncategorizedBREAKING NEWS! Wertstoffmobile Starts This Week!